SB 990 – Six documents related to the historic state law requiring SSFL to be cleaned up to the highest standards. SSFL Health Studies – Six studies from 1997-2007 about the health effects of SSFL, all of which have findings of great concern. 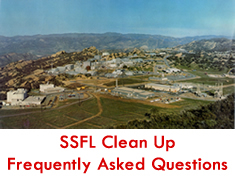 SSFL Contamination – Seven documents detailing the gross radiological and chemical contamination at SSFL. Los Angeles Regional Water Quality Control Board – Three documents related to the LARWQCB’s attempts to hold the Boeing Company accountable for contamination of groundwater from SSFL pollutants. The agreement with DOE will lead to the cleanup of Area 4, where the 1959 meltdown occurred. The agreement with NASA will lead to the cleanup of Area 2 and part of Area 1, where the space agency conducted a great deal of rocket testing in the 20th century. January 15, 2008 letter from Cal-EPA Secretary Linda Adams relieving SB 990 author and champion State Senator Sheila Kuehl of her commitment to amend the bill. January 15, 2008 Letter of Intent between stakeholders and California Secretary for Environmental Protection Linda Adams and California Resources Agency Secretary Michael Chrisman over SB 990. January 15, 2008 letter from Cal-EPA to US EPA declining Superfund status for the Santa Susana Field Laboratory. Summary of Non-Binding Letter of Intent. This is what we all signed on to, including Boeing. Now Boeing is suing the State of California over what it gave its word on. UCLA found that Rocketdyne workers who had high hydrazine exposures were about twice as likely as other Rocketdyne employees who worked at the site to die from lung and other cancers. The primary question the study was designed to answer was whether workers at Rocketdyne/AI’s nuclear sites have experienced excess deaths from cancer associated with their work-related exposures to radiation. The answer is yes. Dozens of different hazardous chemicals were used at various times at the site, but because of resource limitations and problems obtaining access to data regarding chemical exposures, the researchers focused primarily on hydrazines used at rocket-engine test stands. 1981 Area I Burn Pit Profile done by SSFL Analytical Chemistry’s N. S. Fujikawa. This 65-page report, among other things, shows exactly where this burn pit was: right next to a drainage channel that leads eventually to the Los Angeles River. These 1993 to 1994 permit data from the Ventura County Air Pollution Control District show just what kind of chemicals Rocketdyne was allowed to burn up at the lab and how much. Trichloroethylene, monomethylhydrazine, and nitrogen tetraoxide (NTO), all extremely toxic chemicals. NTO used to form a red gaseous cloud upon ignition. Rocketdyne personnel would follow the “BFRC” (Big F*****g Red Cloud) around in a jeep with binoculars to track it – they wanted to confirm it didn’t float into a community below the lab. This April 2006 report by Committee to Bridge the Gap was presented to the SSFL InterAgency Work Group Community Meeting in Simi Valley. The report zeroes in on radioactive tritium, or “heavy water,” which moves through water faster than any other radionuclide and can’t be filtered out. “Tritium found now at 119,000 pCi/L is SIX times the permissible level and 20,000 times background,” the report says. CBG also shows that gross alpha radiation has impacted 15 groundwater wells, all but one in nuclear-associated Area IV, and that strontium-90 was found leaving Outfall 003 on April 28, 2005 at a concentration over the Maximum Contaminant Level. Outfall 003 drains down into the Brandeis-Bardin Campus at American Jewish University in eastern Simi Valley. This April 5, 2010 Department of Toxic Substances Control memo to Boeing points out that TCE was first found in wells at Rocketdyne in 1960, not 1984 like other reports suggest. DTSC says that injecting imported water into SSFL groundwater wells, as well as dumping waste water into leach pits, could make the department rethink its conceptualization of the TCE in groundwater at Rocketdyne. Department orders Boeing to take new information and come up with new conclusions in the company’s analysis. June 3, 2010 Committee to Bridge the Gap presentation for the LARWQCB. Dan Hirsch showed that exceedances of contaminants had doubled in the last year at Outfalls 008 and 009, which lead down to the Arroyo Simi in Simi Valley, where it used for blended drinking water, and down into the Los Angeles River. These exceedances include high dioxins and gross alpha radiation. The amount of TCDD dioxin at Outfall 008 increased by a hundred times. December 28, 2009 Amended Complaint by Boeing asserting that SB 990 is unconstitutional, singles out the company for tough cleanup standards, prevents Congress and the Department of Energy from its objectives and runs afoul of federal jurisdiction over the nuclear part of the old Rocketdyne lab. Chapter of Physicians for Social Responsibility, the Rocketdyne Cleanup Coalition, and the Committee to Bridge the Gap respectfully ask the Court for to allow the Amicus Brief to be allowed in support of the Defendant, Maziar Movassaghi, Acting Director of the California Department of Toxic Substances Control. Explained are SCFC, PSR-LA and CBG’s long and active history with the Santa Susana Field Laboratory. These groups have been in the battle to clean up Rocketdyne for decades. The exhibits are a must read for those who want to get an excellent orientation on just what and where the Santa Susana Field Laboratory is.